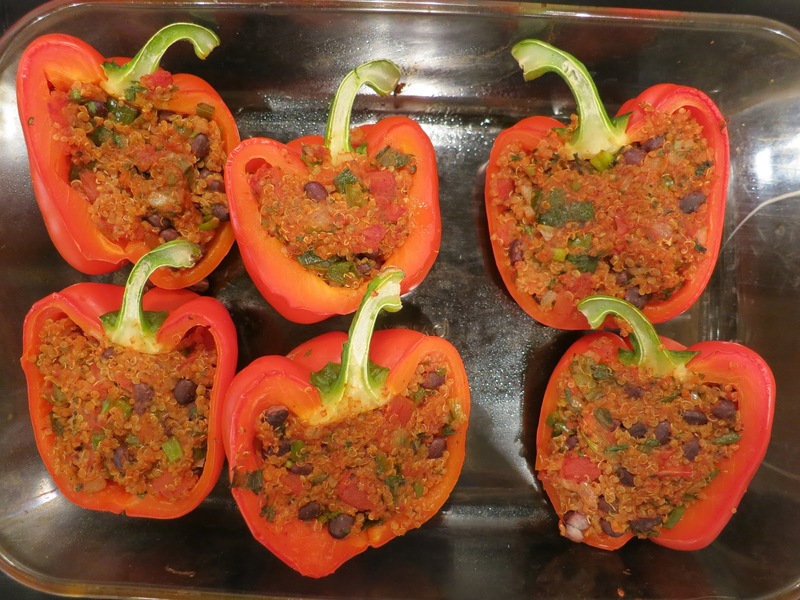 That's right - I'm calling these Mexican Quinoa Stuffed Bell Peppers because I can. I know that you typically use rice in Mexican dishes, but in an effort to make this a healthier dish, I am using quinoa. And I think this is one of my best stuffed bell pepper recipes yet! Part of the great flavor comes from cooking the quinoa in The Organic Gourmet's Vegetable Seasoning. It is a stock concentrate made of sunflower oil, carrots, leeks, onions, parsley, celery, sea salt, and spices. So you get this incredibly rich savory taste from the broth infused into the quinoa. The other great flavor comes from all of the spices. Alright, enough of my banter, here is the recipe. Heat 2 cups of water with the Organic Gourmet Vegetable Seasoning on high heat. See the dark color below?! 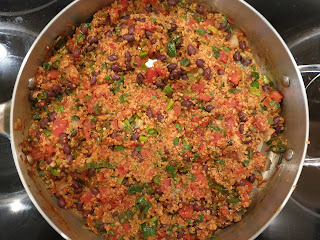 Once it reaches the boiling point, add the quinoa and partially cover. Cook for 15 minutes. Bring a pot large enough to fit 4 whole bell peppers to boiling. Slice the bell peppers lengthwise through the stem. Remove the seeds by cutting them out carefully with a paring knife so as to leave the stem intact because it will look prettier that way. Once the water is boiling, submerge them in the water for five minutes. Drain and blanch with cold water. Set the peppers face down to allow them to dry. Chop the spring onion using both the white and green pieces. Slice the jalapeno pepper lengthwise and remove the seeds, then dice into little pieces. Heat a saute pan on medium heat. Add the olive oil, spices, and salt and saute for 10 seconds. Add the onion and jalapeno pepper and saute for 2 minutes, stirring regularly. 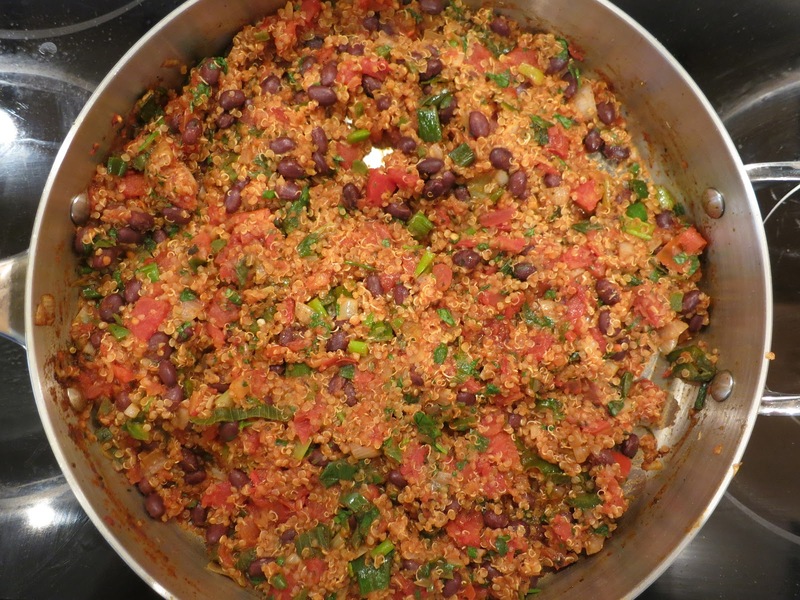 Add the tomatoes, black beans, and 2 cups of quinoa and cook for 5 minutes. 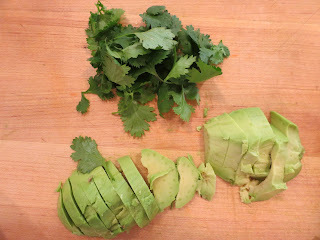 Add cilantro at end and stir and remove from heat. Preheat oven to 350-degrees Fahrenheit. Coat 1-2 glass dishes with cooking spray. Put the peppers in the dish(es). Stuff each pepper with the mixture. You can make it overflowing if you have enough. Bake for 25 minutes. Serve with avocado on top garnished with fresh cilantro. You won't believe how good these are until you try them. Seriously, make them tonight! Oh, and if you'd like to buy that vegetable seasoning, you can find it here.